Rhi: This looks like cheap rubber and plastic with the wrong shade of blue, and the wrong colored boots. I am more intimidated by Barbie. DC comics please fix this. Amber: I have to stay loyal to old school on this one... bring back the blue bottoms with white stars, and the red boots! Otherwise my underoos don't match. charles: How many times does it take b4 these people realize u cant change the costume its part of the character. Ryan: That looks like a costume a cheap stipper would be embarrassed to wear. Can't they do her any better? This looks nothing like the comics or any source material. Looks like a joke. I've seen better fan costumes at comicon. 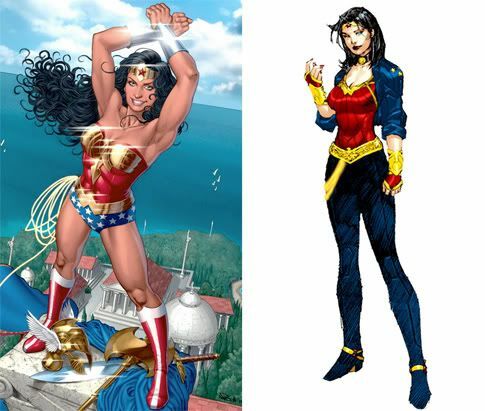 Rather than stick to the classic costume (left), it looks like the studio has decided to go with something closer to the recent comic book redesign (right). I'm not sure that it's the best choice. Messing with a classic brand and drastically changing its familiar look can be devastating and, for a TV show, lead to a quick cancellation. 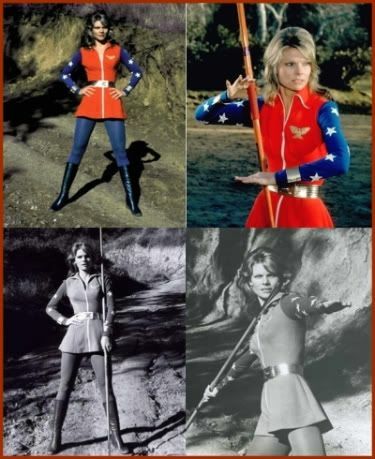 You'd think they'd have learned from the 1974 version that was filmed as a pilot with Cathy Lee Crosby wearing an "updated" version of the costume that looks like a stewardess uniform. I don't recall Wonder Woman having a "Magic Javelin". 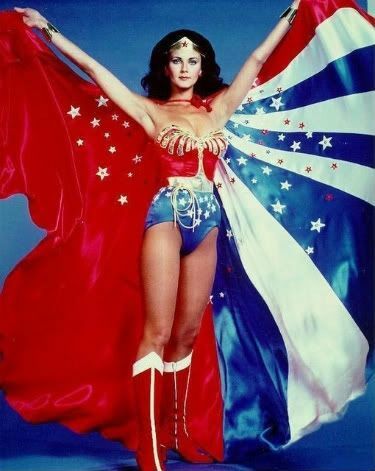 Thankfully, the network realized it didn't work and recast Lynda Carter in the role and gave her a costume that everyone recognized and visually enjoyed for a variety of reasons. Let's hope David E. Kelley and his producing team listen to the the feedback and make a few changes before the show ends up with the same fate as the Bionic Woman remake a couple years ago. Bring back the red boots and get rid of the Evil Knievel spandex pants! UPDATE: Someone created a version of the new costume with red boots (below) and, honestly, it does look a lot better. I could almost tolerate the Knievel pants if they changed the boot color.